Russian hackers were able to read President Obama’s emails due to a White House computer system breach, and in a separate embarrassment, Russian hackers accessed an unclassified Pentagon network. And now they’re suspected of the IRS debacle. Reports on these incidents rarely get more specific than assigning blame to “Russian hackers,” which means that what could be completely separate crime rings are lumped together in the imagination as a sort of DIY cyber-KGB. But this isn’t a case where a brilliant cabal is outfoxing US security through dazzlingly sophisticated hacking techniques. We’re making “Russian hackers” look like shadowy Soviet geniuses because the security on government websites is such crap that it’s low-hanging fruit for thieves. 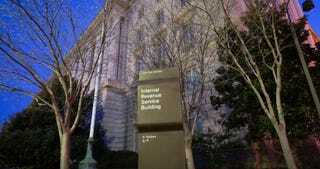 There wasn’t even any hacking in the IRS situation, just plain old bad site security. It’s beyond time for the IRS to make a better lock, and hopefully this humiliating string of breaches will spur a government initiative to be less awful at cybersecurity.